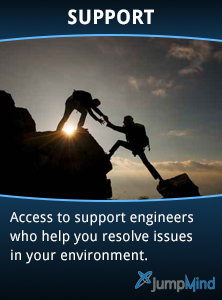 Support Access - Depending on the level of support, customers gains access to support engineers during business hours (9 am to 5 pm Eastern Time, except holidays). For Priority 1 issues, Enterprise Support includes access 24 hours a day, 7 days a week. Initial Response Time - Customers benefit from a guaranteed maximum time when a support engineer responds to an issue. A response means that JumpMind will contact the Customer to (i) acknowledge the issue report, and (ii) gather more information in order to assist with problem resolution. Priority 1 Response Time - Depending on the level of support, a Priority 1 level escalates the issue with the support team and guarantees a maximum time within which a support engineer responds to the issue.